A couple years ago, I found a bag of old ceramic beads in a thrift store. The beads were large and they had large holes and they were pretty, with flowers and designs on them. They were perfect for securing straps on leather journals and adding a bit of prettiness. I used all those beads and then couldn't find anything else similar. The local craft store carries some beads with large holes, usually wooden or glass, but they are always very plain and boring. So! I finally asked Gillian Soskin if she could make me some beads with large holes. She makes gorgeous lampwork beads (available on Etsy: GillianBeads.Etsy.com) and I knew they would be perfect for books if only the holes were big enough. I was right, the beads she made for me are fabulous! They work perfectly on the strap and they add just the right amount of prettiness to the leather covers. Thanks Gillian! Love the new beads! 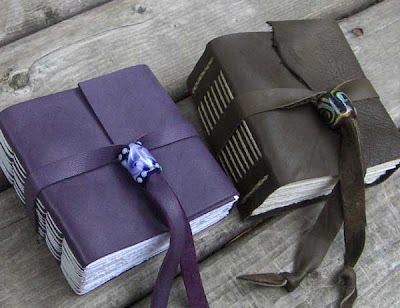 They look great against the leather covers of your journals. 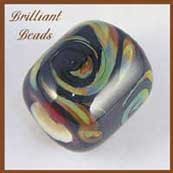 Beautiful beads. What a good idea and how nice to have something specially made for your books. The beads look wonderful, as do the lush journals. I adore the purple one on the left.